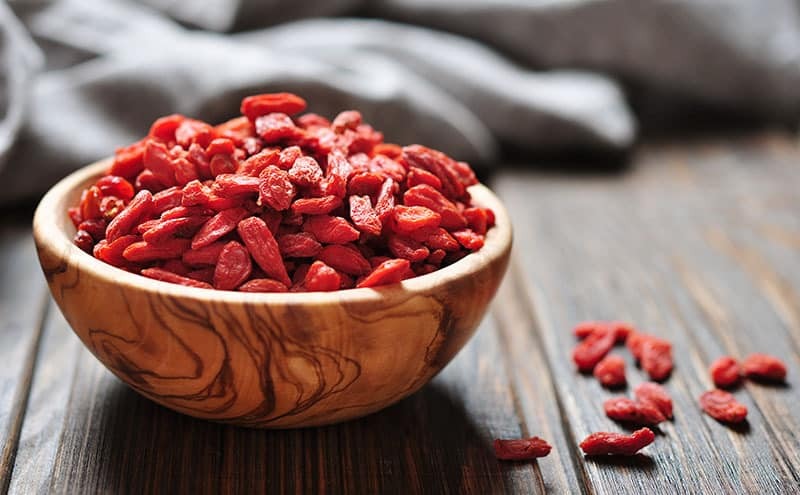 Research trials show that goji berries have impressive health benefits, including improved immunity and cardiovascular health, a boost to brain and liver function and positive effects on mental health. Goji berries are native to Asia where they have been used for various purposes over thousands of years. They have been referenced in ancient Chinese texts dating back to the first century AD. In ancient China, goji berries have been linked with long life, beauty and vitality. These berries were praised for revitalizing the skin, strengthening the muscles and tendons and protecting from illness. So how many of the reported health benefits of goji berries are supported by scientific research? In this article, we’ll find out everything you need to know. What’s in a goji berry? What can they do for our health – and is it all good news? Goji berries, also known as wolfberries, are the fruit of one of two species of the boxthorn plant, which, along with potatoes, eggplants and tomatoes, are members of the nightshade plant family. The berries themselves are a bright orange red color when mature, and grow to around 1 – 2 cm. The fruit contains between twelve and fifty tiny yellow edible seeds. The raw fruit is not often consumed due to the bitter taste and potential toxicity. People generally consume the dried fruit which tastes sour with a slight medicinal or herb-like bitterness and a sweet aftertaste. Despite their small size, goji berries are quite a knockout in the nutrition department. They are packed with vitamins, minerals and other nutrients, including eight of the essential amino acids. Goji berries also contain a wide variety of other phytochemical compounds designed to give the plant flavor, scent and color in addition to protection from insects and UV damage. These phytochemicals have been shown to have numerous positive effects in the body. The vitamins and many of the phytonutrients in goji berries make them stand out from the crowd as far as antioxidants are concerned. They may not have the strength of blueberries – the berry antioxidant champion – but they are a great source of a wide range of different varieties. Antioxidants help to give the immune system a boost and protect the body from free radical damage. The immune system is our own personal army to deal with invaders. It provides us with daily protection and is key to our daily battle for survival against bacteria, viruses and other threats to health. The high content of vitamins A and C in goji berries is key to building immunity. These two nutrients are vital in preventing common illnesses like a cold, protecting eye health and reducing the risk of more serious chronic diseases like cancer or neurodegenerative decline. Inflammation has an important role to play as part of the body’s immediate response to an acute injury or illness. However, chronic or long-term inflammation can do more harm than good; it has been highlighted as a feature of cardiovascular disease, diabetes, arthritis, many cancers and nervous system disorders. While many different phytochemicals have been identified in goji berries, not all of these compounds have been extensively researched to date. Maintaining blood sugar levels to within normal range is important for everyone, but especially for people with diabetes. Keeping blood sugar in check helps avoid a number of health complications including insulin resistance – a need for excessive insulin production. As pilot and central controller, pretty much nothing else works without the brain – it’s an extremely complex and amazing structure. 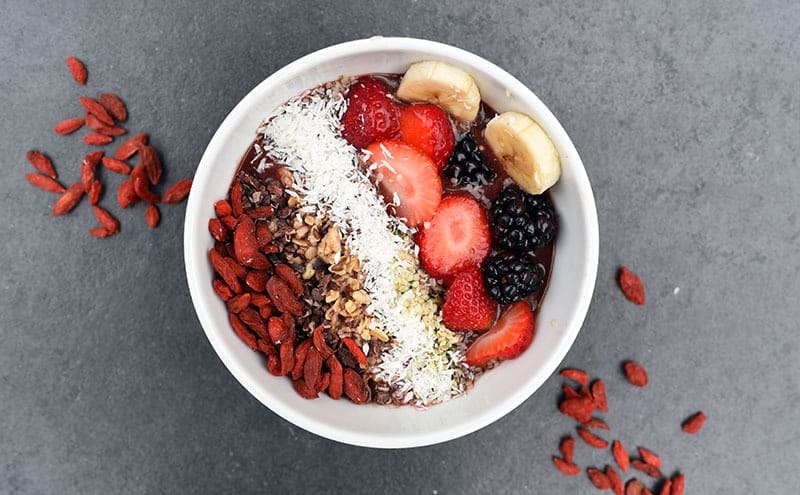 Research suggests goji berries have a protective effect on neurons, preventing injury and potentially decreasing the symptoms of Alzheimer’s disease. 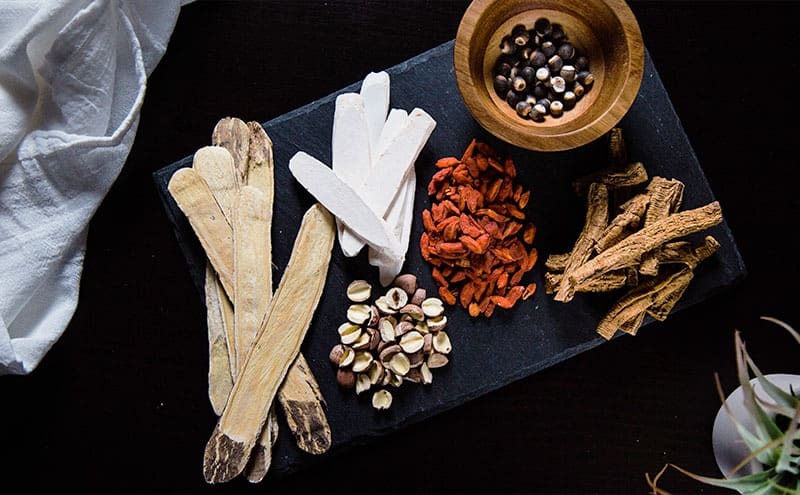 In tradition Chinese medicine, goji berries are said to promote liver health. Western research also provides support for this. The liver is an extremely busy organ, carrying out a 24-hour blood filtering and quality assurance service, nutrient storage facility and a toxic waste removal plant all in one convenient package. As with many other fruit and vegetables, goji berries are loaded with beta-carotene, an antioxidant which helps promote healthy skin and has been linked to the prevention of skin cancer. Yet another positive effect of the goji berry antioxidant army is the ability to protect eyes from conditions such as macular degeneration, an age-related disease and the most common cause of blindness in older adults. The antioxidants help stop eye damage which results from exposure to UV light and free radical chemicals, and so is naturally beneficial for vision. When it comes to feeling good, goji berries have been shown to help with this. Studies have indicated that drinking a daily dose of goji juice can have a noticeable effect in improving the mood state of participants, increase energy levels and general level of well-being. Participants in this study also reported improved athletic performance, increased ability to focus, a feeling of calmness and better quality of sleep after consuming goji berry juice. Goji berries also come with another added bonus. They have been found to increase the quality, quantity and movement of sperm, as well as protecting the testes – where sperm is produced – from damage by toxins present in the body. Goji berries are a great source of dietary fiber, which slows down the digestive process, keeping us feeling fuller for longer, and providing a prebiotic food source for the good bacteria in the gut. As a member of the same plant family as the deadly nightshade, goji berries contain a toxin known as solanine. 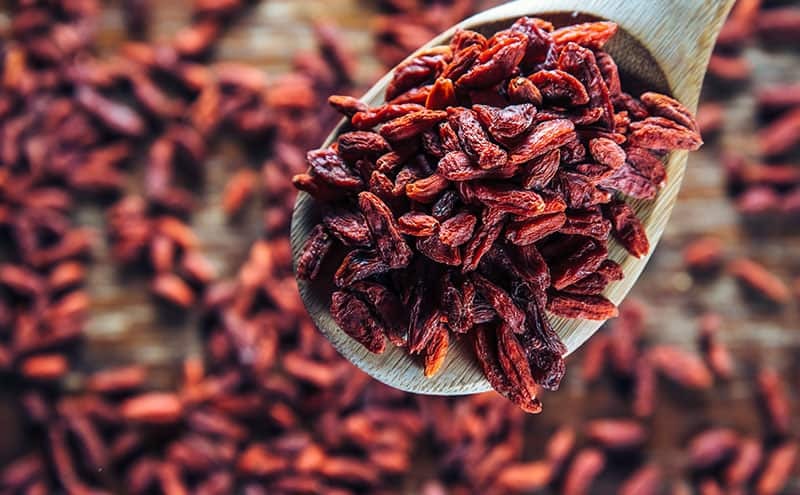 While this does not pose a problem to the majority of the population in small amounts, this glycol-alkaloid toxin means some people should be cautious about consuming goji berries. Patients taking warfarin and other anticoagulant medications are advised not to consume goji berries or goji berry juice as it will increase the risk of bleeding. Caution should also be taken with antihypertensive medication, as goji berries may reduce blood pressure, which could result in blood pressure dropping too low. There have been a few rare cases of a negative reaction in people who take diabetic medication after consuming a lot of goji berries. Reports of allergic reactions to goji berries are uncommon. Goji berries and juice should be avoiding during pregnancy, since they contain a substance called betaine which has been linked to higher risk of miscarriage. As is the case with all dried fruit, portion control is important. Goji berries, while healthy, and contain only 23 calories in a 28 gram serving, they do contain some sugar and it can be easy to overdo it! What Do You Do With Goji Berries? As a tart but sweet ingredient, goji berries lend themselves well to a variety of sweet and savory dishes. The dried fruit can be enjoyed as a lone mid-afternoon snack or rehydrated for a few hours to restore their plumpness and reduce the bitterness. They can be added to a trail mix or fruit salad, mixed into pilau rice, risottos, stews and soups, brewed with hot water to make a tea or blended into a smoothie. They work well in cookies and flapjacks, sweet and savory breads and muffins – they are exceptionally versatile. As with cranberries, goji berries are excellent as a sauce or chutney to accompany meat like pork and turkey. 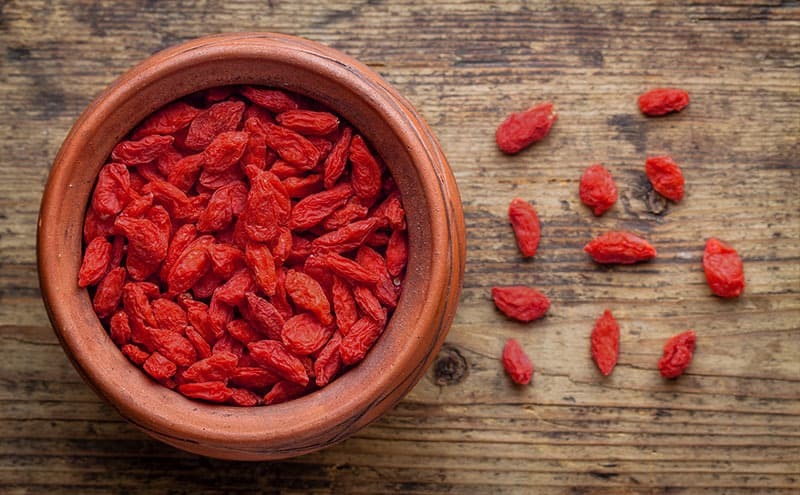 Goji berries bring with them a whole host of health boosting properties. Goji berries are right up there with the high rollers when it comes to antioxidants, providing the immune system with plenty of ammunition for zapping those free radicals, and some helpful anti-inflammatory action too. The plant compounds in goji berries can potentially have a positive effect in some cancers, help control blood sugar, improve brain function, protect the liver and heart…the list of benefits seems endless. There are some people who should avoid or carefully monitor their consumption of goji berries, but as a rule they are very healthy addition to most diets.